How to create a beautiful family photo wall without overwhelming yourself. February 3, 2017 by High Desert Frameworks! Step one: Doing some research will help determine the scope of the project and what you want to accomplish. You might start with a small wall in the hallway. Family photo walls are a great way to bring personality into your home and you don't have to spend a fortune. For some "Pinterest" inspiration check out Larson Juhl's wall art grouping board. Next: There are some great photo / gallery wall ideabooks on Houzz.com including a recent article by Mary Jo Bowling a Houzz contributor and self proclaimed serial remodeler. 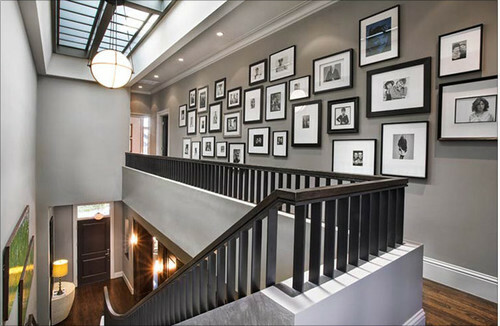 Her article: How to Design a Family Photo Wall -- New project for a new year: Display your favorite images of loved ones for the most personal gallery wall of all [ https://goo.gl/HbCUY1 ], is a great place to start your research. And Finally: Reach out for assistance. You are not alone. Overwhelmed? Don't be. Just get started! DIY projects can be fun but they can also be a little bit of work! Let High Desert Frameworks help you with scanning, printing and custom framing your family, vacation and important photo's. We also have a great selection of unique and affordable 5x7, 8x10 and 11x14 photo or ready made frames to kick off your project. Upload your digital images to our upload site [ https://www.highdesertframeworks.com/upload ] and we can resize/crop and enhance your image to a 5x7, 8x10 or any custom size. We print on a number of different and beautiful paper stock and then help you choose the frame that works for you and your project. Come Frame With Us!